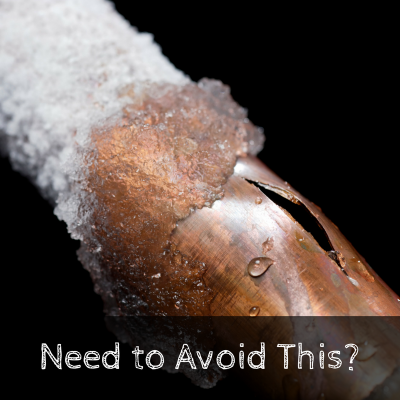 Whether you’re escaping the blustery, wintery weather, or visiting family for the holidays, if you’re leaving town you’ll want to take a few precautions to prevent frozen pipes. The best practice is to turn off the water to your house, but don’t stop there! Be sure you open up each faucet to let the water drain. It’s the water in the pipes, after all which will freeze and potentially burst. Ever thrown a soda in the freezer to quickly chill it, only to forget about it? That exploded mess in your freezer is basically what happens to your pipes when they freeze. When water gets cold, it expands and if it has nowhere to go, the pressure will cause the pipe to burst just like that can of soda. To prevent frozen soda syndrome from happening to the walls of your home, take inventory. Walk around your home and determine which faucets rung along an outside wall. It’s easy to forget things like the utility sink in your laundry room or garage, or perhaps it’s the guest bathroom you rarely use. Any pipes which run along an exterior wall are going to be more susceptible to freezing. The rest of your home may be insulated well, but those areas may not be as protected as you think. This is especially true in older homes. What if you’re only gone overnight and don’t want the hassle of turning off the water at the source? One precautionary tip is to simply turn on/open up each faucet that has exterior facing pipes. Turn them on just enough that there’s a very slow drip so water can drain from the pipes a little bit. This keep water moving which means there’s less likely of a chance of the water freezing.